Canada and The United Kingdom further renewed their status as international partners on the focus in the marine energy sector. Government, industry and academia met from around the world at the Ocean Renewable Energy Group Annual Conference as they discussed and catalyzed on the topics of renewable energy and the harness of clean energy from ocean tides and waves. Great Britain has elevated its status to a world leader and a significant partner on the topic of carbon emission reduction. Their pledge to reduce emissions by eighty percent by the year 2050, combined with their huge natural marine energy and their world-class development and research centers have meshed beautifully with the government’s proactive policies. Canada’s strong research capabilities paired with their ambitious government policies have made them an ideal partner in the advancement of the ocean power industry. The two countries have been working together on a number of projects. 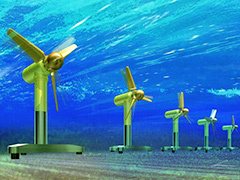 Nautricity, one of several United Kingdom companies and academic institutions that have been working in Canada to advance the development of the areas ocean power industry. The remain on the cutting edge of development and technology, Canada needs innovative thinking partners such as the United Kingdome. They are completely committed to accomplishing what it takes for this industry to flourish. The partnership is also occurring on a policy level, as both countries recognize the benefits and experience overlaps in the ocean energy realm. Marine energy is part of a greater effort by both countries to encourage excellence in cross-sector growth for sustainability and services in low carbon technology. Marine energy represents a major factor in the United Kingdom low carbon agenda, as they feel the tidal and wave energy represents a potential to generate around $23 billion (U.S.) for the British economy by the year 2050. The research centers for the UK and Canada have also mutually shared interests in marine energy development with energy centers in Scotland and Nova Scotia. Posted on April 30th under Renewable Energy Sources. This is my kind of meeting. Two of the best countries are taking the lead to show the rest of the world that yes, it can be done. Travels to England showed me how far ahead they are, for such a small country. These two countries put the U.S. to shame. In the past, England polluted their oceans and waterways and Canada overfished their seas to the point of almost no return for some species. It’s great to see the two countries are leading in something that’s good for themselves and the world. Canada has been involved in reducing our carbon footprint for a long time. I remember reading about the initial conversations between us and the Brits a while back. They seemed to have taken things a lot more seriously since then. There is a long standing bond between the U.K. and Canada, so I’m not surprised at this at all. The ‘green’ message in Canada has been at the forefront for years. We are just waiting for the rest of the world to catch up (as always). Have to give them full credit. When all of the other countries turned their attention to their homefront, Canada and the United Kingdom stepped up to the plate.